TO experience how one of your idols engages in the creative process makes it seem possible, you too, can create music. 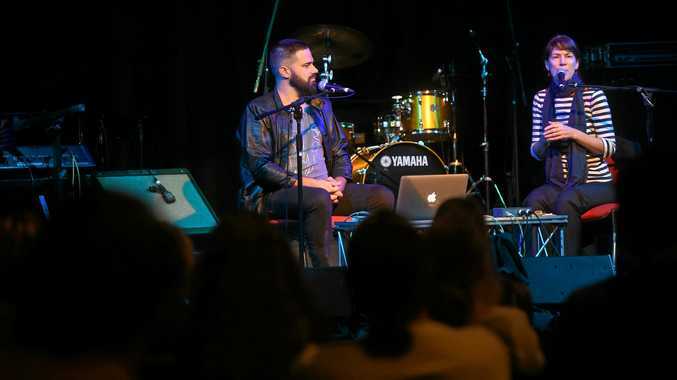 The Cat Empire have influenced Tom Skeen for years and there he was, Harry James Angus, at StudioOne29 in Tom's own learning ground at Southern Cross University teaching students and alumni the tricks of the trade. "It was amazing. Here's a musician who is really recognised from a band you love; you almost can't believe it; that he's giving you the benefit of his experience,” said Tom. Tom is a drummer in his fourth year of a bachelor of music and has decided on a career as an audio technician as a result of the opportunities that have been afforded him at the uni. Cat Empire's lead trumpet player and vocalist was at SCU teaching in a series of songwriting masterclasses. Tom said Angus's main message was: as long as you are comfortable with your song and are playing with passion, there are lots of ways to create effective music. SCU lecturer and coordinator of the master classes, which are sponsored by APRA AMOCS and the school of science and arts, Leigh Carriage said it was amazing to have Mr Angus back again for the second time in the past year to inspire budding songwriters. "He is an incredibly generous, affable and intelligent musician and a great communicator of ideas,” Ms Carriage said. She said it was good to see a full lecture hall of people earnestly interested in music. "We had a full house of students and what I loved so much was we had alumni that went back 10 and 20 years. They were told you should do whatever you need to make it happen, she said. Bernard Fanning will be at SCU on May 3.